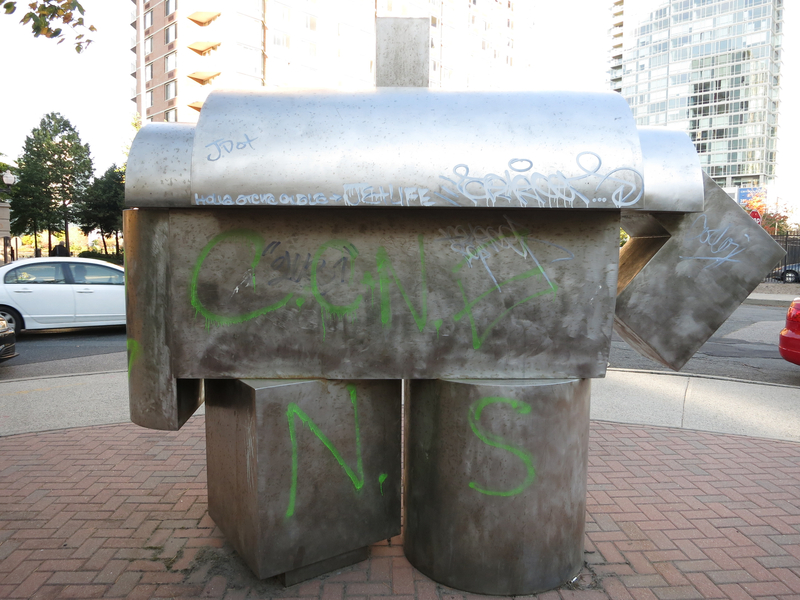 Sculpture or time machine portal for graffiti astronauts? I ran into one of my characters from a short story on a walk through downtown Jersey City not too long ago. He stood still at the corner of Second and Hudson Street. Despite his steely silence, he spoke to me from the words and letters painted on his torso. This wasn’t your average José, this was a character that had once been written about in the New York Times. In that 2001 article, he is described as a “Man of Steel.” But instead of the blazon, red letter S on a superhero’s chest, this man of steel has a graffiti green letter N on one leg and a letter S on the other. A necklace of white graffiti stretches across his shoulders. I have walked by him many times in recent years but on this day in late October 2013 he took on a new shape and form—that of a graffiti astronaut. “Graffiti astronauts,” is the title of a collection of short stories I am working on. When I saw the sculpture it was as if a character in my head had manifested on the street before me sheathed in metal. 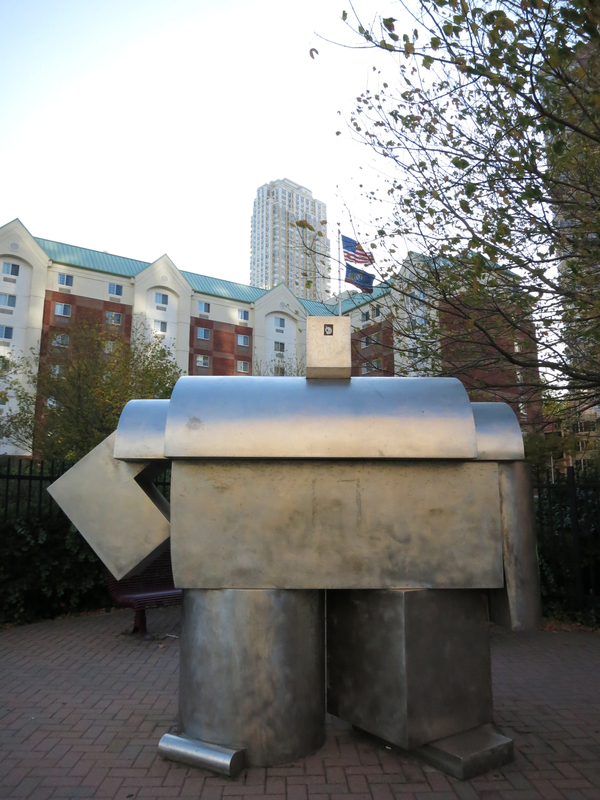 The “Longshoreman,” sculpture in Jersey City. “This is what a graffiti astronaut looks like,” I thought. When I took a closer look, however, I noticed that artist Steve Singer had long ago named the sculpture “Longshoreman.” Commissioned by Candlewood Hotel and Suites, the piece was installed Oct. 26, 2001. The sculpture represents Jersey City’s past when long shoremen worked the waterfront on tugboats and ships that lined up at the moorings. This was during the industrial and manufacturing age in the 19th and 20th centuries when many railroads ended at the Jersey City waterfront and factories dominated the landscape. I wasn’t around for the Jersey City of that time, but when I walk along the waterfront through various neighborhoods, I pick up on clues—like this sculpture—that offer glimpses into what once was. Then again, this could be a TARDIS disguised as a sculpture that serves as a time and space travel machine for graffiti astronauts. That would be awesome!